April has ushered in warmer mornings and afternoons. Our young fruit trees are full of leaves and some are in blossom. We look forward to apples, peaches, cherries, apricot, and plums this year. Sveta planted fourteen fruit trees over the past four years. I will begin working on the house again in the beginning of May. I hope it will be a productive summer. While visiting Marganets this month, we stopped in at the Transition Home to see how Yana was doing with the massage therapy program. She treats children who struggle with psychological and emotional problems. This visit, Yana introduced us to six year old Galina, who has cerebral palsy. She and her three siblings have been living at the Transition Home for a week. As we watched Yana give massage to Galina, we learned about Galina’s home life. Poverty has made it difficult for her mother to care for her four children. The government removed the children from their mother and placed them in the Transition Home until the mother will be able to improve the standard of care for the children. This has created some interesting opportunities for Galina. While at the Transition Home, she will receive massage and exercise therapies. We spoke to the assistant director and confirmed that the status of the Transition Home is now related to healthcare and respite day care. So, the therapies that Galina is receiving can continue on an “out patient” basis when she returns to her home. 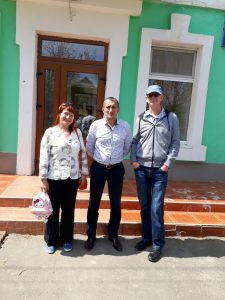 We visited the school in her community of Maksimovka and talked with the director there. We informed her of the healthcare opportunity for Galina. She and Enna were happy to hear this good news. Enna is one of the English teachers at Maksimovka school, and is also our MUCH manager in Marganets. In the process of our many conversations, Enna told us about her son. He is in his third year of dental studies at the university in Poltava. He wants to learn massage therapy as a second area of expertise. Here is one new individual interested in working with children. Two days ago, Sveta and I were invited to visit an orphanage with our church pastor and four others. The director of the orphanage, Ruslan, showed us all of the facility and shared many things about the children. Before leaving, Sveta and I talked with him about his massage therapy program. There are fifty-six children with varying degrees of physical and mental disabilities. Each will benefit from massage therapy according to their unique needs. Some do not speak, some cannot walk, some have emotional and social problems. There is one massage therapist who works part-time. She is expected to provide massage therapy for as many of the children as she can. The general treatment is for twelve days. To get the best result for most of the children, two additional part-time massage therapists are needed. Now we have three new opportunities for massage therapists. Whenever we talk about finding massage therapists, the statement is always the same. People to become massage therapists are easy to find. Money to pay for their training is the question. Money to pay for their work remains the obstacle. From 2004 until 2017, MUCH has trained five of the current nine massage therapists who serve our children. If we can find the sponsors, God will show us who He has prepared with a special passion to bring health and healing to the children most in need. For a long time doctors could not establish the diagnosis or understand what treatment is necessary to appoint Andre. The boy was already one year old, but he could not hold his head upright, sit, or stand. As a result, the doctor diagnosed cerebral palsy and hypotension of muscles. For the first ten-day-course of massage therapy for Andre, his muscles strengthened, and there was visual evidence of this. In the position of being on all fours, the child began to hold up his head. Ira, the massage therapist, and Andre’s parents were happy. They saw results! Two months later when Ira came to the child to give a second massage course, she found out that all the results were lost and the boy’s status returned to its original condition. She was surprised. What happened? Ira began to think aloud, trying to understand why the great result disappeared. She encouraged Andre’s parents to have her child evaluated at the Institute of Genetics in Kharkiv. The mother urgently took the baby to this Institute where, after the examination, doctors found the cause and gave a new diagnosis. There was a lack of the vitamin B group. The lack of this group of vitamins disrupted the conduction of nerve impulses that can lead to such symptoms as cerebral palsy and hypotension. Now the parents know the diagnosis and how to fight for their Andre. Ira has medical education and great knowledge of how to help children. She also believes and knows that God helps and heals. She always prays for the children. Parents and Ira see God’s action in restoring and healing their children. Another child that Ira works with also has a very interesting story. When a medical examination at school was conducted for Tanya, a 12-year-old girl, she was diagnosed with scoliosis and torticollis. The doctor said that the girl had one leg shorter than the other by 2 cm and suggested that she wear a wedge in her shoe. Her parents bought a wedge and Tanya used it for a while. Also, parents decided to visit the Center in Odessa. The doctor took x-rays of Tanya’s spine. It turned out that Tanya’s legs are the same length.The curve in her spine caused the hip to rise on one side. This created the appearance of a shorter leg. Also unnoticed and certainly untreated in her childhood was torticollis, which aggravated this diagnosis. Ira began to do massage therapy for Tanya in the polyclinic four years ago and here’s the success! After the first course of massage therapy, the parents saw the result. The back and neck became smoother. Ira stopped working in the polyclinic and began to do home massage therapy. Tanya’s parents were very pleased with the results and the loving attitude of Ira toward their daughter. Subsequently, Ira continued to provide massage courses for Tanya at home. Her parents are very grateful and happy. Tanya is diligent and completes all the exercise recommendations of Ira. Everyone sees huge changes. When Mark and I see joy in the eyes of the parents we are grateful. To have a massage therapy program for children who have disabilities is amazing in this country. We are most thankful to God, our massage therapists, and our sponsors. This entry was posted in Special needs school, Therapeutic masssage on May 23, 2018 by Sveta Koehler. We hope that each of you had a pleasant holiday celebration. Sveta and I spent our Sunday afternoon with friends. Lena met us at the bus stop and we traveled to our house together for lunch. Tanya arrived later. It was so nice to see these three friends together share old times and new direction in their lives. Sveta prepared buckwheat and chicken, garnished with garlic greens. Hard boiled eggs and grated beets, both topped with mayonnaise and greens. Pickled tomatoes and pickled cucumbers added unique flavor. Finally, Sveta’s mother’s preserved vegetable salad completed the festive meal. When we were at this school in the fall, we visited the fourth grade class. They showed us what they were doing with the computer tablets that MUCH provided. This time we visited the first grade class to see what they are doing with the computers tablets that were designated to them this year. The children surprised us with their artwork. They are ready to learn to use computer technology! Why wait until they are older. Director Nataliya has the vision for her school to move forward now! The big surprise came when I asked Svetlana, the first grade teacher, if she knew how to use the computer tablets before they were given to the school. She told us with big excitement that she had to teach herself first, then she could teach the children. That is how far behind small towns and villages in Ukraine are with education tools. By improving the teaching tools, MUCH is changing the potential of this school. This will have long term effects on the future of Ukraine. Better education changes countries; it is changing Ukraine. This teacher thanks you! 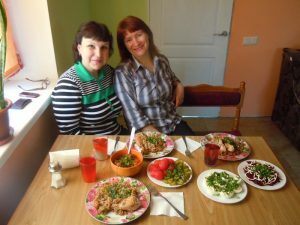 Sveta and I met these two friends at the Transition Home in Marganets. Inseparable five year olds, Irena and Sasha go to Yana together to receive massage therapy. You were introduced to them in our March newsletter. It was a delight to watch Yana give each of them a massage treatment. In the process, Sasha had many questions. Looking at his picture, can you imagine what his inquisitive conversations could be? Yana thanks you for the opportunity to bring emotional healing to these children! Irena kept busy with her art work while Sasha enjoyed his massage. These are only two of the thirty children who live at the Transition Home. Each child has a different story. Each story will break your heart. MUCH has sponsored the Transition Home through our clothing program for more than seven years. We started the massage therapy program here this year. We see good progress. Not only are these children from broken homes healing emotionally, but most are being placed in good Christian foster homes. Some are being adopted. We are pleased to partner with these professionals. Massage Therapy is an ongoing program. We have nine massage therapists working in four cities and one village. At the current exchange rate that is around 27 UAH for every $1, the massage therapy programs cost a total of $800 per month to maintain. We have one more massage therapist waiting in the wings for funding in the large village of Ovidiopol. If you are one of the 250 people receiving our newsletter regularly, please know that only about 20 of those 250 who receive our newsletter support our programs regularly. Imagine, if nine new sponsors gave $10 each month, we could support a massage therapist in Ovidiopol. Our help with Education is about projects. We learn about the needs of a particular school, and we raise money for the specific projects. You have seen our Christmas fundraisers each year as an example. Imagine, a yearly project is about $4000. If 200 people gave only $20 each, we could easily provide the education needs of a village school each year. A village school serves the children from two or three surrounding villages. Think of the impact you can have on the life of a child! Become a MUCH sponsor and give a donation today! Mark and I visited Chornomorsk in March. Mark spoke to the students of the Transportation Scholarship Program. He talked about the value of education and the impact that they can make on their community. He also told the students that higher education is not only about learning information, but more importantly, it is about learning how to think. When you know how to think, you can teach yourself many things. We see how committed they are to learning. They fully understand that MUCH and their parents invest love and finance in them. The gratitude of the students is expressed not only in words, but also the excellence of their study. These four students are doing a good job with their studies! Mark and I are glad that we have such an opportunity to encourage (left to right) Arthur, Nastya, Anya and Daniel through those who support the Transportation Scholarship Program! They are very grateful about the ongoing support from MUCH. They thank you! 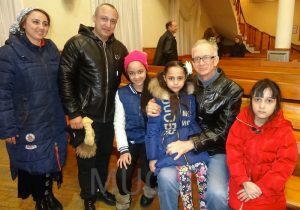 One woman approached Mark and told him that seven years ago, when her daughter Valya was three years old, the doctors diagnosed the girl with Pes valgus of the feet and rickets. These further lead to disability. Throughout the year the girl received several massage therapy courses. Valya’s mother is so grateful! She thanks all of you very much. Now Valya is walking better and has no pain. Her mother’s face is shining with joy! It’s so nice to meet parents who are happy that their child is healthy! All good things come from God! Valya received massage therapy through MUCH. We are leading the way to correcting some disabilities of children in Ukraine. Very heavy knapsacks and the wrong position to sit at the desk led to poor posture and pain in the back and cervical spine of the twin sisters Olga and Anya. Ira, our massage therapist conducted a course of therapy for these girls. Now Olga and Anya do not feel pain, their postures have been corrected. Ira gave them recommendations for physical exercises to strengthen the muscles of the back. 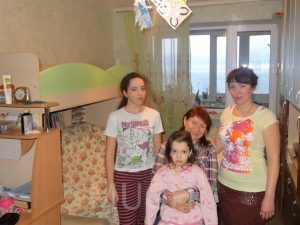 Olga and Anya’s Mom expressed great gratitude to us and the sponsors of MUCH! I deeply believe that twelve years ago God opened the door to massage therapy and continues to bless children through MUCH! Three massage therapists Natalia, Tanya and Ira help children and comfort their parents in Chornomorsk! We need YOUR help to move MUCH through another twelve miraculous years. Thank you in advance! The children thank you! Ukraine thanks you for helping to change their country! This entry was posted in Christmas Fundraiser, Massage for children with disabilitiees, Progress, Special needs school, Therapeutic masssage, Ukraine Missionary on September 6, 2017 by Sveta Koehler. July brought sunny weather and many guests. It was very pleasant to visit with family and friends. The August evenings are becoming cool, but the days remain hot. I look forward to September 1, which will bring an immediate change of season, and the first day of school for the children. Our midyear fundraiser was successful. Thanks, to the many MUCH sponsors who came to our aid. With the 500 + children that we serve, we have a big budget. What happens to the children of the orphanages during the summer months? They go to camp! There are many government-owned camps remaining from Soviet times. The children are sent to camp according to age groups. This year, Natasha, the massage therapist at the Dobromel orphanage, and her seven year old daughter went to camp with the children. It was a great time for all! Each week had a theme. One week was devoted to sports activities. Other weeks provided excursions, picnics, and climbing in the mountains of Carpathia. The children visited a shallow lake where they participated in the popular mud bath. Can’t you imagine the fun the children had smearing liquid mud over each other. Natalya B. is one of our massage therapists in Illichevsk. She uses multiple massage techniques combined with special exercises and medical equipment. Her individual approach for each child and her great love that she projects toward her little patients achieves great results. Ivan is 2.5 years old and he has Cerebral Palsy. This child was born with a severe disability, with asphyxia and was in intensive care three months. Doctors said that the child was hopeless and advised parents to give him to the Baby House for children with severe disabilities. However, the parents did not agree with the predictions of doctors and took their child home. Up to age six months, the boy did not focus on or follow an object with his eyes. He could not roll over from back to stomach, and back again, and could not do what healthy children at this age do. After three twenty-day courses of massage, when Ivan was one-and-a-half years old, he got up on all fours and began to crawl and to sit without support, but he still could not walk. 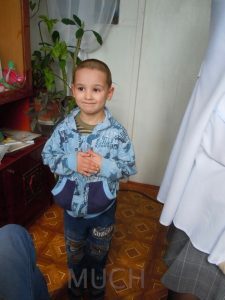 To date, after regular massage courses, Ivan has good progress: he can walk with the support of adults holding one hand, and he speaks elementary words. He is a very sociable and outgoing child. Contrary to the predictions of doctors, this child lives, grows, and develops! Natalya B. has worked with him since he was three months old. Along with massage, she uses other devices, one which is the “Adele” suit. This medical costume has adjustable elastic straps that create resistance for the muscles. This suit creates a muscular skeletal framework that holds the limbs in the correct position for movement. 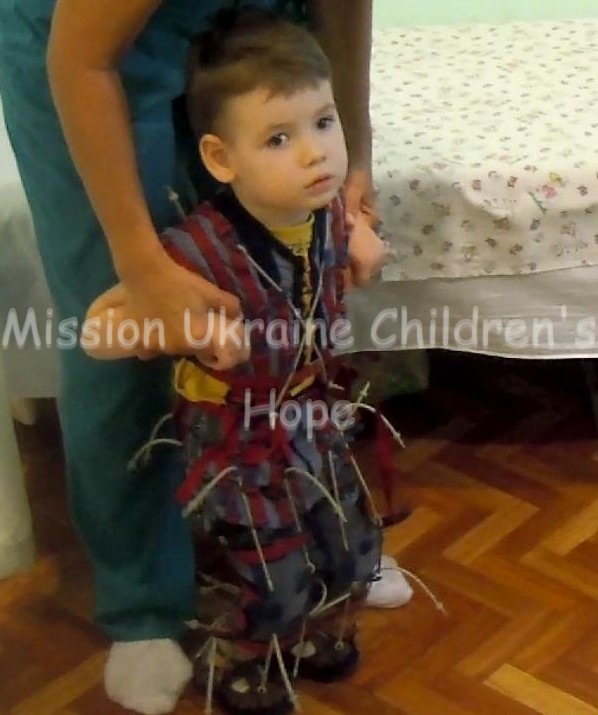 While wearing this medical costume, Ivan develops new reflexes and activates cells in the motor center of the brain. This improves the ability to achieve movement, coordination, and even speech. It is amazing! To see our video of these two children, click here. The second child, Jan, who receives massage therapy from Natalya B. is a wonderful girl. About two years ago, Mark and I first visited the family when they moved to Illichevsk. We wrote about her in the February 2012 newsletter. Jan could not roll over or hold her head upright. Her parents do everything possible that can be done to help their child: regular massage courses with special passive exercise, stimulation training on a horse, medication, and one time they took Jan to the Dolphinarium. It takes much time and money. Her parents have a huge appreciation for your help. Thank you MUCH sponsors for your financials support. They are very grateful and gave us a video where Jan swims with dolphins. After two year of massage treatment, Jan began to hold her head up. She can turn her head, and follows moving objects with her eyes. She responds to voice, can do some voluntary movement, and has improved posture. Jan’s parents are immensely happy seeing these results. We saw tears in her mother’s eyes when she told us about her daughter. Again, please accept this big appreciation from the parents and from us. Mark and I are very thankful that you support us as missionaries in the Ukraine. Let God’s blessings abundantly come into your life! God bless you! Most times that Sveta and I visit a child receiving massage at his or her home or in one of the clinics, I am overwhelmed by the hope that I see in the eyes of the parents or grandparents. Progress is slow, but the parents are so hopeful for their children. They thank you, the children thank you, and we thank you for your loving support. This entry was posted in Baby House, Changing children's lives, Early Intervention, Massage for children with disabilities, Therapeutic masssage and tagged Adele suit, Early Intervention, Massage Therapy on August 22, 2013 by Mark Koehler. Happy New Year 2013! Our Christmas fundraiser this year fell short of our total goal, but we will be able to operate the computer classes for the complete goal of one and a half years. Learning will be eciting for us! We (picture to the right) are very excited about that! The remainder of the funds raised will go toward the massage therapy programs at Dobromel and Froonza that will continue from last year. A second part-time massage therapist for the Dobromel orphanage may be possible in the future, if we can find more monthly sponsors. MUCH had two surprises this Christmas. After reading our November Newsletter, friends from North Carolina offered to buy a sewing machine for the orphanage-school in Marganets. When the assistant director heard this news, she was very pleased. The children will be thrilled with all of the mechanized options that they will be able to use. They will even be able to sew in script to personalize their projects! The second surprise involves a church, a mission organization, and a new sponsor. Between the three of them, money was contributed to buy two new washing machines for the Transition Home in Marganets. The director and the washwomen were very pleased to receive these machines because they had been washing clothes and bedding for 30 children by hand. After our two month fundraising and holiday time, Sveta and I have returned to Ukraine exhausted, but we will begin this year with a new perspective on Ukraine. Sveta’s first visit to America did yield culture shock for her. For me, I saw America through her eyes, which in turn, helped me to see Ukraine with new eyes. After ten years, the cultural differences and the visual effects have become very “normal” for me. When I would visit America in the past, my world, my perspective, was only bigger. Now, seeing through Sveta’s eyes, I see two different worlds. Our time in America was constant mental activity. Thanksgiving, Christmas, New Years, my niece’s wedding, and family visits kept us busy. Then, there were the many sponsors that we visited and the presentations that we gave. Sveta’s one year of studying English proved to be very successful. She spoke in front of large groups without hesitation. Her Ukrainian perspective of MUCH gave them new understanding of our work with the children. Additional stress visited us in the last few days of our journey. My passport was at the Ukrainian Embassy in Washington DC, waiting for a Visa D to be attached. When I called, I learned that I had sent the wrong amount of money, too much, and they couldn’t accept the postal money order. Mom sent another while Sveta and I were out of town, but the adventure heightened as we tracked the return express mail envelope. After great efforts by two gracious postal workers, (unbelievable in Sveta’s eyes), the envelope was available to be picked up at 7AM the morning that we were to fly back to Ukraine. My heart sank as I opened my passport to learn that I had only 45 days on my Visa D. I later learned that this is normal under the new law. The second step is to register with the government office for a one-year Visa D in the city where I live and work. After I get this, my next step will be to apply for full time residency, not citizenship, as the spouse of Sveta, a Ukrainian national. This will be available after we are married two years, January 10, 2014. Our next adventure met us at the JFK International Airport. Our connecting flights to Odessa included two stops in European Union countries, Germany and Austria. This was not a problem for me, carrying an American passport. On the other hand, Sveta had a Ukrainian passport; therefore, she needed a Schengen Visa to fly into more than one EU airport. The clerk at the Austrian Air desk was able to give us two options for flights that would go directly from JFK to Vienna where we could connect with our final flight. We were blessed with the first option, standby tickets for a 6PM flight that would leave in two hours, and a $316 change fee, versus a $1016 change fee for a flight the next day. As we waited patiently, we were invited to the 6PM flight. On we went. Our focus in 2013 will be to create videos of the work that we do with the children, particularly in the massage therapy programs. These videos will be available to view by way of the internet or a number of our sites, such as Flickr, YouTube, our blog, Facebook, and Twitter. The massage therapy video that I made for the presentations on our trip opened new eyes of understanding for many people. Our two-month trip to America is over, we returned to Ukraine, and of course, I am very glad to see my family and friends in Ukraine. I was a little sad that I had to leave my wonderful new family and friends in America; they gave us attention, love, and support. I enjoyed socializing with people; I saw a lot of care and a desire to give us their valuable time. I was bathed in love. After talking to people and reviewing what they saw, I learned and saw many differences in their culture and way of life. First of all, I was very impressed with the people. They were very welcoming, friendly, discreet, ready to help, and to encourage. I did not feel lonely or outcast in this new culture; I felt the love and acceptance in a great family where there is love. Today it is considered that the experience of a new culture is a shock, because it is unexpected and can lead to negative evaluation of one’s own culture. I do not appreciate my Ukrainian culture in a negative manor. I love my country, and God has put love in my heart to help Ukrainian women and men of retiring age when Mark and I retire. We will help them find hope for the future, because it is usually the time when the Post-Soviet people retire to a meaningless life. Children are grown, the grandchildren are adults, and they have no work or hobbies. There is no further purpose in life, having completed all previous goals (attending university, having a good job, a family, a baby, raising grandchildren) the people are at a loss – how to live on? Mark and I are thinking about the time when we will retire. We want to help these people regain confidence that life can be rich and fruitful, even after the person has retired. We already have a plan to do it. While in America, I saw a perfect example of people in the retirement age having an active and productive life. All the people we met in America were eager to know about the children in the orphanage. I know many stories because I know many of the children. Each child has their own unique story; they have experience with big blows of fate for their young age. R. (to my right) is a boy from the Dobromel orphanage. He looks older than his years. Maybe it is because he was found on the street many years ago when he was a little boy. He could not say his name, age, or give any information on who his parents were. R. was given his name by the boarding school, along with some created identity where they recorded the year of his birth. Police were looking for a long time to find his family, but did not find anything. The boy is an orphan only in words. Because of the lack of true documents, he cannot have the financial help benefits of being an orphan, as there is no proof of the death of his parents, or their rejection of this child. Last autumn, R. (to my right) finished boarding school and now attends trade school as a builder. He lives in a dorm and gets a very small $30 monthly stipend. Since the law does not considered him for an orphan pension pensioner, after he finishes all of his education, he will no longer be entitled to the stipend, much less any other government aid. The director asked us to help him. We know a Christian family that has experience working with children and helping them adapt to life after the orphanage. We think that they will help R.
K., (left) 7 years old, has cerebral palsy. He can say only one word “mama”. K. has respectable parents, but they are very busy and very seldom visited the child, and of course, the boy misses them and has become very closed. When the massage therapist gave massage for him, the first few days he was very stressed and did not want to be touched. Now K. is gradually beginning to open up and blossom like a flower that was drooping for a long time without water. Computers will help us with our language skills. Two brothers, I. and P. (right) are special. I love them very much. When Mark and I come to the orphanage, the elder brother is always beside us; the youngest brother is shy and follows us at a distance of several meters. They cannot speak well. Their parents are alcoholics. When it is vacation time, parents take these boys home, but it is really better for them to stay at the boarding school. The boys told me they do not like their mom, and they do not like to be at home. Every adult has a destiny that he can change. Children are dependent on their parents or other adults who are involved in their lives, whether positive or negative. Particularly dependent are the children with physical and mental limitations. These children have little ability to change their own destiny, but their parents or other adults in their lives may have big influence on their future. Thank you very much for your financial support of the computer program that will operate for a minimum of one and a half years at the Dobromel Orphanage-Boarding School. After having more than 20 computers sit idle for more than a year, the children will now embark on a new adventure in learning. It is all because of your generous contributions that this has become a reality. Your love, prayers, and financials support, our friends and partners, help us perform many projects to help children. Thank you very much! As we enter 2013, we see change happening in Ukraine that will affect the children. The government is closing many of the orphanages, mainstreaming the children into regular schools. Our focus on health care, education, and clothing will remain our objective. Our ability to reach out to more children this year and next will depend upon people with hearts for the children. If God is nudging you to make a monthly commitment to help our children, please understand that $5 or more dollars a month will make a difference in the lives of our children. As we work together to build a stronger Ukraine through caring for its children, we work together to build a stronger world! Thank you for taking an interest in our children who look to us for help. This entry was posted in Changing children's lives, Children in Ukraine, Christmas Fundraiser, Dobromel, Early Intervention, education, Life in Ukraine, Special needs children, Therapeutic masssage, Ukraine Missionary on January 29, 2013 by Mark Koehler. Lots of computers, but no teacher to open the minds. September in the hills of Dobromel met Sveta and me with temperatures in the low 50s F. We traveled through light rain from L’vov to Dobromel, but had four days of crisp autumn weather to share with the children. An hour of video clips and 313 pictures captured the activities and class work of the children. Sveta will share more in her article below. It is time, once again, for the MUCH Christmas Fundraiser. This year we will focus on two new programs in Dobromel. At the Dobromel Orphanage, our first priority is to support a computer program that will put 20 computers already in place, to use. The director has a classroom full of computers with a complete PowerPoint system, but no staff position in the budget to pay for a teacher. The government does not see the value. Our goal is to raise enough money for January through May of 2013, and the September 2013 through May 2014 school year. This will pay a teacher to educate pupils in the realm of computer skills that will directly affect the futures of the children. The total cost of this program for these fourteen months is $1750. We saw results from the first month! At the same orphanage, we would like to add a second part time masseuse at the orphanage. We have seen such great results in the first five month of this year; see Sveta’s Journey in the June Newsletter. MUCH bought a massage table for the orphanage massage room, and Natasha, the masseuse/exercise therapist, continues to do her job well. The application possibilities of massage for the 120 children with special needs continue to grow. A second masseuse will create additional services for as many as 20 children a year. The cost to run this program for fourteen months, the same time period as the computer program above, is $2800. The total goal of our Christmas Fundraiser for 2012 is $4550. What is surprising to me is that the government has allocated funds for the purchase of computers, and the orphanage is equipped with a computers classroom, although, the government does not provide a staff position for a teacher to conduct lessons. In the beginning of this school year, the director of the orphanage could not start the computer lessons for children because there was no teacher. The director said that he will find someone to teach, but, of course, he will need funds to pay for the work. We pointed out that MUCH is interested in sponsoring education programs, and there is a desire in our hearts to find the means to pay for this work. With quality documentation and good results, we believe that the government will provide a teacher position and will pay for his work in the future. First, they must try out the program and create these opportunities. That is where MUCH comes in. Children with physical and mental disabilities need an initial level of education. The computer can improve the technique off teaching, and provide computer skills. There are many programs written to help special needs children learn more easily. All of this will help them to fit into society more smoothly. Computers provide new ways to learn basic knowledge, develop hand eye coordination for activities such as typing skills, and bring the world to the student through the internet, opening a huge library of knowledge. These machines increase the rehabilitation of mentally challenged children to a new advanced level, expanding their social circle and ideas about the world, helping to develop cognitive abilities. For $1750, the director can staff a computer teacher for a year and a half of school time, helping these special needs children. Will you share your Christmas giving with them? It will change their lives forever! Almost all of the children in the orphanage need massage. Last October, the director, the nurse, and I, visited each class of children for whom I was giving massage. The director personally examined each child, having him or her raise the shirts. As he viewed their spines, he was surprised how many children have problems with their spines. The director sees a great need for a second masseuse. Unfortunately, at this time the regional authorities do not provide funding for staffing this job. The director will prepare reports on the results of massage for the children; the staff will supply evidence of the changes they see in the children after a course of massage. He will meet with a doctor who specializes in treating children with physical or mental disabilities to obtain qualified assistance in obtaining an official position for a masseur/masseuse. For $2800, we can add a second masseuse, providing massage for a year and a half of school time for these special needs children. Will you share your Christmas giving with them? It will begin to change their lives after the first month of massage. Some of our little freinds! When Mark and I visited the Dobromel Orphanage, the children and the teachers were all glad to see us. We were also happy to see our little friends again and spend many days with them. This time we saw a lot of new children, first graders and older children. Among them was the child R. – a very beautiful girl (wearing the red shirt – left). A new boy Y., came to the orphanage/boarding school after spending his first six years in a Baby House. Here is an example of a Baby House. He is an orphan. We do not know how he was raised until this time, but many of his actions express aggression. When I talked to Mark and the children on the street, he took a big stick and tried to hit us. I took it from him and hugged him, but he pulled away and hit me with his little hands. What were the conditions he lived in and how did he grow up? Surely, he did not feel love for himself and no one caressed him. This conclusion could be drawn from his aggressive behavior. A big step up from the Baby House. Natasha, the masseuse, gave Y. a 20-day massage. She says that he has changed a bit compared to the first days of the school. Natasha has a lot of patience and love for children. It was very difficult to massage this child; she needed time to give him some instruction. The atmosphere in the boarding school is full of love. I like the attitude and policy of the educators and teachers individually toward each child. The atmosphere has discipline and love! Here the child will feel and see love, and learn discipline. We saw the happy faces of the children. As you can see, they are joyful. Of course, no one can replace a good family and good parents with an orphanage/boarding school. Although, for many children who lived in dysfunctional families, the orphanage is much better. During this visit, I saw good changes in the children – especially the youngest ones. They have become more disciplined, understanding the rules of behavior in their own community and the community at large. We may not speak, but we want to communicate! Mark and I have captured on video how the lessons are held in the classroom. Classes are formed by age, but in each class, there are children who have different levels of intelligence. For example, in seventh grade, three boys and one girl (right) are not able to speak well. It is difficult for them to speak and their level of understanding is very low. Teachers give these children simple tasks to write, or draw simple circles, sticks … With the computer class they could work independently with materials that are specifically for their level of intellect. We handed children photos from our previous visit (left). It was so great! The children were waiting for the new pictures, so, the next time we want to bring to each child a small photo album. This idea came to us after R., a boy of 9 years old (right), had shown us how he stores your photos. He unbuttoned his little suit jacket and proudly showed the photos that he folded several times and “carefully” stored in the inner pocket of his jacket. Our Dobromel masseuse, Natasha, sends to all of you, dear American friends, very much thanks for your attention and love for the children. We also express our gratitude to you and the Ukrainian people who also take part in these programs. We are hopeful, friends, that you see the great needs of the children that we highlight for our Christmas fundraiser this year. Please consider them as you make your Christmas plans. May God bless you as the season of giving draws near. This entry was posted in Baby House, Christmas Fundraiser, computer, education, Massage for children with disabilitiees, Special needs school, Therapeutic masssage on November 10, 2012 by Mark Koehler. Sveta and I have completed our first summer together. We first looked into each other’s eyes on September 5, 2010. She tells me that these two years seem like two months. We are very blessed to have each other as husband and wife, friends, and mission partners. September 1st is best known in Ukraine as First Bell. This Day of Knowledge rings in the school year with celebration, speeches, and music. Teachers, as the educators, are the heart of education and are highly respected. Education is the heart and backbone of society and the country. The children honor the teachers with flowers and dress in formal clothes for this event. This day is most joyfully celebrated by the first grade children and those who are graduating. As we have discussed in previous newsletters, MUCH is very concerned about educational opportunities in Ukraine. We are assisting children to attend college and university with our Transportation Scholarship Program. In addition, our efforts inspire the teachers in the orphanages to improve the education program to meet the current and future needs of the children. MUCH has a deep desire to open new doors to a new future for our children in the general education system and for the children with special needs. Health Care has been our second focus during these fleeting summer months. In the massage programs, most of the children that we work with have some type of Cerebral Palsy. The biggest factor for these children is that as their muscles grow, the muscle imbalance grows non-symmetrically. Correcting the imbalance of the opposing muscles is the main goal, but it is not the complete solution. The weaker muscle must also have a stronger connection with the brain. The signal starting in the brain telling the muscle to move must become balanced with the signal telling the opposing muscles what to do. This remains an ongoing challenge until the child has stopped growing. Sveta and I have been visiting the different masseuses in our Illichevsk program. Our visits included the MUCH clinic, a private clinic, and a number of home visits. We videoed the massage in progress while discussing the prognosis of the child. Of course, the mother was with the child, allowing us to learn even more about the home life and the parental support and encouragement of the child. Some of the situations were very disheartening. Some of the children, being under the age of three, were completely immobile and mostly unaware of the environment around them. One child, completely breaking my heart, I believe suffers from Fetal Alcohol Syndrome. Other children that we visited were showing some signs of progress. When we began treating D. five years ago, she could not balance enough to walk. Now, at eight and a half years old, she walks with 90% balance and attends the regular school system. Sveta has a heartwarming story about her connection with one of the mothers and her son. I know that you will enjoy reading her story, and I think that you will feel as if you are right there with her. Before meeting Mark, I had a normal private life typical of the Ukrainian women: work, adult children who have their own families, grandchildren, parents, and friends. Nevertheless, there was internal dissatisfaction within my life. I wanted something more, but I did not know what. I learned this after living with Mark as his wife. My life began to be more beautiful when I started to serve the children in the orphanage and to help my beautiful husband in his mission at large. Before I started giving the children massage, I was not aware that special-needs children existed. At the Dobromel Orphanage, as I was introduced to many children with many different special-needs, I began having great conversations with them. I saw their lives closer and more personal, causing a deep compassion for them. I loved these children very much. My first massage experience with special needs children was in the Dobromel Orphanage last year in October before Mark and I were married. Mark saw the needs of massage for these children on previous visits. He talked with the director of the orphanage and proposed a massage program for children. He proposed a twenty-day massage demonstration with me and another masseuse, who is also an exercise therapist. The director agreed with one condition – that he would see results. The results were almost immediate, and the new exercise therapist/masseuse of the orphanage continues to see good results. Your support of our massage program makes this possible to continue. children who live in this boarding school/orphanage, many who do not have parents? What are they feeling? I can go home and be with my family; I have hope, but these children have no hope. What is their future?” My tears dried up immediately. God gave me the opportunity to enjoy and understand the lives of the children in the orphanage. How great is their desire to be in a family, to be loved, to have a corner with toys, a cat, or a dog. Every evening, different children came to visit me and I treated them to sweets or cookies. They sat down on my bed and I talked with the children. They asked many questions and loved being photographed. This month, Mark and I visited a family who has a child with a disability. This boy, D., is 3.3 years old. For two years, the doctors were afraid to prescribe massage for this seriously ill child, but his mother, L., was insistent and she begged for a massage appointment. The child cannot sit, stand, or roll over. He is only making small movements with his arms and legs. He looks at us with his beautiful blue eyes and long lashes. When you start talking to him, he smiles. D. can only eat food mashed through a blender. He does not have chewing reflex and can only swallow. His mother feeds him every 4 hours. D began receiving massage 15 months ago. L. excitedly told us about the results. After each course of massage the child becomes calmer, the intensity of his epileptic seizures is reduced, and his muscles are relaxed. The soul of this child lives in a body that has multiple developmental disabilities. He cannot move but he has emotions and feelings. D. loves when L. holds him in her arms. Now he has a new reaction. Instead of only whimpering when he is unhappy, his face has begun to express emotion. He is now able to understand. He can be offended and this emotion is expressed in his face, and he begins to cry. The doctors offered to operate on D’s. brain now that he is older, but it is an expensive operation and they do not give a guarantee for improvement. The government provided a special wheelchair, but it is very heavy and awkward to use. It is uncomfortable for the child, so L. rarely takes D. on the street for a walk and some fresh air, and her circle of friends is limited. She spends all of her time with her child, taking care of him. L. was happy to meet us. We made friends with her and her beautiful little boy. Because she carries D. so much of the time, holding him in her arms, she has developed a severe forward curve in her back. I gave L. a 10-day massage in our home that yielded good results. With tears in her eyes, the young woman thanked Mark and you, dear friends, for your attention to her son, and for your help. 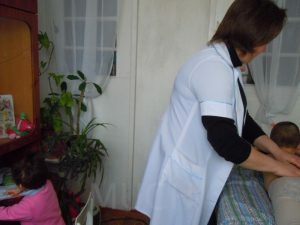 Since she cannot bring her son to the clinic, our masseuse goes to their home and gives D. a massage on the kitchen table. L. was very touched that complete strangers would help her, and although she is optimistic about the difficult situation in her life, at that moment she was crying. Communication with other people in such families is limited. Families with healthy children have a very busy pace of life and they have no time to pay attention to such families. Mark and I have decided to share our time periodically with families who have children with disabilities, to give them our attention, care, and to support parents and children in the realization of their personal and family projects. My time will provide massage for mothers, and other helpful activities, depending on the circumstances of families. It remains amazing to me how people from America, who certainly have their own problems and difficulties, desire to help children in Ukraine. God bless you for your participation in these good works. I believe in the power of God’s love flowing through Mark, me, and you. I thank God for all that He does. I am grateful to the disabled children who I met in my life. They helped me develop a new heart and new eyes to see their world and to see my life with new purpose and meaning. Sveta and I will be with the children in Dobromel in the last days of September. Additional heartwarming stories will be coming your way. This entry was posted in Day of, Epileptic siezures, Financial sponsors, Health Care, Knowledge, Muscle imbalance, One year anniversery, Sveta's Journey, Therapeutic masssage, Transportation Scholarship, Ukraine orphanage on September 15, 2012 by Mark Koehler.